I noticed a Dark-eyed Junco sitting on the table in a corner of my garden. 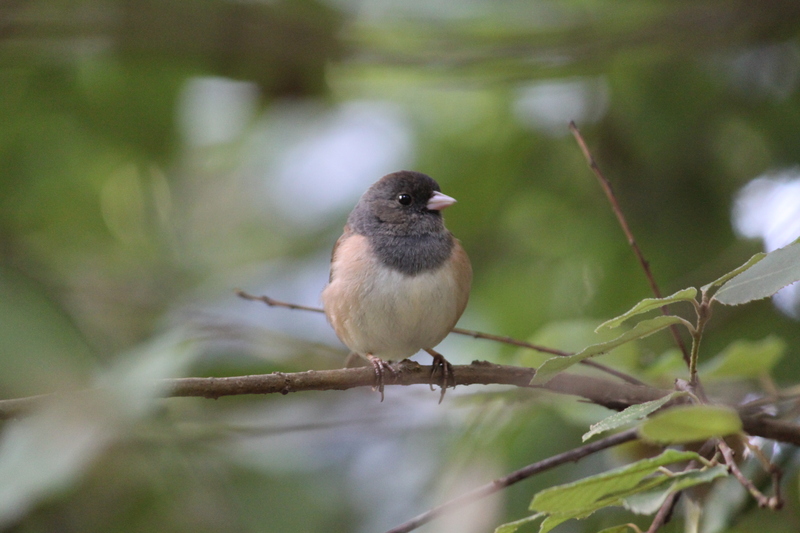 Junco’s are common here, no big deal and still delightful, but this one was courageous. He was not about to move even as I stepped outside to get a better look, though he did keep an eye on my every move. Then, I saw why he was determined to keep his post. A female, foraging for seeds on the driveway, appeared from under my car. With him keeping guard, she had no need to be wary. When he gave the signal, they both took flight to the shelter of the nearest tree limb. This exquisitely represents the masculine and feminine principles to me. Not as in male and female gender, but as in the yin and the yang that makes the whole of each of us and all that is. The wild feminine dances while the masculine creates and holds the container. What is the water without the shore? Spring’s return is a delightful time. The first butterflies emerge and dance with the wind. Wildflowers burst forth, seemingly and sometimes truly, overnight. The evening air is filled with the most delicious fragrances, my favorite being jasmine. I’ve noticed the squirrels again. After months of gathering acorns, they seemed to disappear. Now, one has returned to its commuter route; feeding young in the nest? The first quail have appeared as well. Like the male Junco, the male quail also serves as a reliable sentry for the female and her chicks. At the turn of the year, I wrote about the conflicting energies of robust New Year’s resolutions, astronomical events and seasonal cycles. While we experience a sense of new beginnings on the first of the year, it is mostly because we replace one calendar on the wall with another and we make a big deal of it with parties and a big ball in NYC that drops at midnight. Winter is a time of rest, hibernation, integration. It is a feminine season and its element is water. Our energy is in retreat. Spring brings in the masculine energy of fire. Everything wants to burst forth: chicks from eggs, butterflies from chrysalis, buds from branches, blossoms from stems, even us from our houses. The sun calls and the world responds. This is the season when the energy to make changes, to transmute our realities, is most powerful. At this equinox, the dark watery feminine meets the active fire-y masculine and a new creative wave is unleashed. It’s where polar opposites meet and create the new way. It is a time of birth and rebirth. If we had intentions at the New Year that seem to have gone astray, we can likely revisit them now with much more success. As everything bursts forth, so does our enthusiasm. We now have the heart to be disciples to that which we most desire to create and that is the true essence of discipline. We become the sentries to our own creative dancer. The Spring equinox (in the northern hemisphere) occurs at 10:32 am PDT on Saturday March 20, 2010. At that point, we will be at a midpoint between the shortest and the longest days of the year; the balance of dark and light. The entire time I’ve been writing this post, butterflies have been riding the waves of the breeze, surfing past my window. I take it as a sign. I’m not going to list, in bullet-point fashion, how to create your Spring Equinox Ceremony or ways to creatively magnify your intentions. What I do suggest is that we all revisit what it is we want from life and what we want to bring to it. What will have you dance like butterflies, surf like dolphins, soar like hawks? Bring your brilliant masculine energy to create the container, the sentry, together with the wild creative feminine energy in you to make it happen. Imagine what becomes available when discipline and creativity play together. Oh, and maybe clean out your garage and dawdle* a lot – not necessarily in that order. Just now, I saw a hawk land in the redwood across the way and I stepped outside to prepare to photograph it in flight, should it choose to circle nearer and overhead. As I waited, I became distracted by a small black and orange caterpillar crawling up the wall. Since I’d taken a little movie of one at my front door about an hour ago, I thought I’d get a couple of still shots of this one. 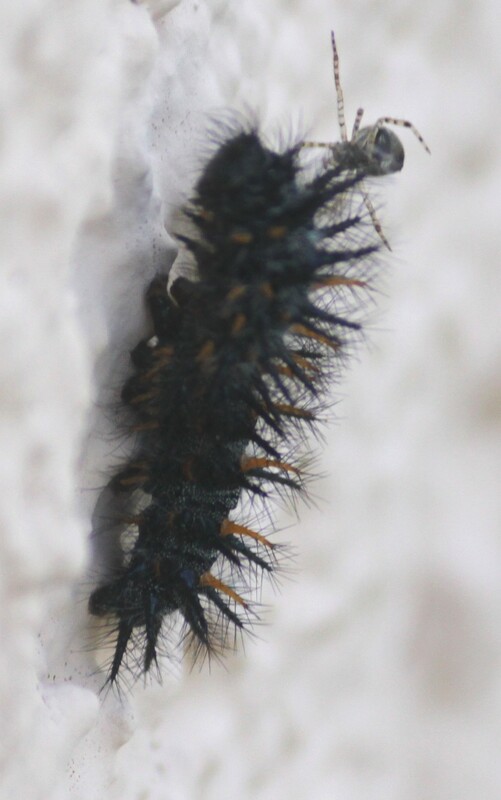 When I zoomed in, I was surprised to find that a tiny spider was furiously working its magic thread between the caterpillar and the wall. I couldn’t help but wonder if it was the same caterpillar. Had it traveled all this distance and found the right place to go into metamorphic goo only to become a banquet for a spider? Let’s play with the Mystery Message here (and if you want more like this, sign up to receive Mystery Messages from me). Butterfly (and thus, caterpillar) is about transmutation and the dance of joy. Spider is about creativity and the weaving of fate. What will have you allow your creative urge to make a meal of the old you, your old stories and old identities, so that you may be transformed into one whose heart is light as a feather and dances for joy? How might you be allowing the web of fate and the sting of life events dictate who you think you are and prevent you from becoming the joyful passionate being you were born to be? I just went back out to check on the caterpillar-spider drama. Neither was anywhere to be found. Ten minutes gone and it was as if the event never happened. Wow – now that’s a mystery in and of itself. Then, to top it off, I saw a walking stick. That’s a rare sighting for me. This one was so small and slim it looked like a fiber shred. Wow – another delight delivered from the Mystery. How can I not travel life with eyes wide open? How can I not dance for joy? * For more posts on dawdling, click on “dawdling” in the cloud to the right or locate dawdling under categories. What is the difference between accepting fate and welcoming it? If one enters fully into the circle of creation and destruction, does the dance between them become so intimate that it disappears? oh and so we don’t get to just answer yes or no, how about: When one enters fully into the circle of creation and destruction what happens to the dance between them? Love having you as a “playmate” on the full moon path! upon the foundation of my dream, The Jewel Community…. literally, this weekend, while the birds canter and tweet above my window, I’ve been in the creative process.. I realize that I could not have created a moment or day’s or months prior, what is now birthing. Thanks for reminding me that winter was a time of retreat….sometimes I felt “I accomplished little” and there really is no measurement…and all unfolded perfectly, as I synchronize with the rythms of the cosmos. Beautifully said Annie. I can feel the grace with which you move through your day and the excitement for that which is being born. oh yes! This is most apropos for me – I’m moving out of the Underworld and really FEELING the energy you’re talking about here. And I am SO curious about what/how the old me could be a feast for my creativity (did I get that right? lol – kinda laughing here -wondering if I mixed metaphors) — anyway..i have been thinking of exactly these things, and your clear and inviting words here feel like confirmation to what I had bubbling around (but not quite articulated) in my noggen. Thanks!!!! LOL – love the Bon Apetite! Hey, forgot to say the first time around that i love the photos!!! Copyright Notice: all photographs and writing copyright © Kathy Loh and Full Moon Path, 2009. (exceptions are obvious, like YouTube videos or otherwise credited words and images) Unauthorized use and/or duplication of this material without express and written permission from this blog’s author and/or owner is strictly prohibited. Excerpts and links only may be used, provided that full and clear credit is given to Kathy Loh and Full Moon Path with appropriate and specific direction to the original content as long as Kathy Loh is notified and provided with link to the posting of the material. Photographs may not be reproduced without written permission. If you would like to purchase a photographic image, please contact Kathy Loh directly at kathyloh@coachkathy.com Thanks for your cooperation.